The pressure was on after a tie between American Record holder Caeleb Dressel and World Junior Record holder Michael Andrew tied in prelims of the 50 fly. Andrew set the WJR mark last summer at World Juniors, but for the first time at a major meet, Andrew isn’t a junior anymore. The 19-year-old pro, who became the first swimmer to go pro at just 14 years old, lived up to the hype tonight as he earned his first roster spot for a major long course international meet. Andrew and Dressel were neck-and-neck. It was a toss up at the finish, but Andrew had a slightly better reach, touching in 22.93 to beat Dressel (22.97) by 4 hundredths. That’s a new Championship Record for Andrew, breaking the former mark of 23.05 set by Dressel at 2017 Nationals. 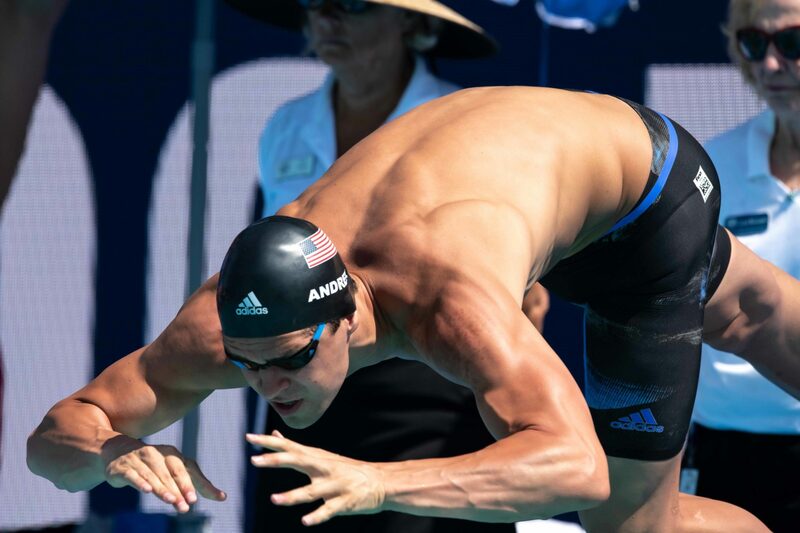 Andrew is now the 3rd fastest American ever in the 50 fly and owns the 4th fastest American performance in history. His former best was a 23.16 from last summer. Dressel’s American Record stands at a 22.76 from semifinals at 2017 Worlds. Dressel has yet to qualify for Pan Pacs or Worlds at this meet. He finished 6th in the 100 free, one of his main events, on night 1. Though it seems clear that Dressel hasn’t rested much for this meet, his speed tonight bodes well for his Pan Pacs prospects. he should be able to make it in at least the 50 free, and with his 50 fly performance, he may have a pretty good 100 fly in the tank for later on as well. Anxious to see Andrew in the 100 breast! MA. 21.25 prelim. 21.25 final. MA….the real deal. What a Race! I’m happy for him, but still holding out hope he can qualify in an Olympic distance/event too. USA Swimming really has brainwashed people good into thinking only the Olympics matter, even though Worlds are usually faster and have more records set. And the rest of the entire swimming world does 50s of every stroke regularly, but you know. That defines exactly what 50s are. I don’t know what planet you’re from where the definition of a race is something different. The 50 free is an Olympic distance event.